Let's get to making these super easy baked flautas! Shred about 2 cups of rotisserie chicken. To that, add about 1/2 cup of prepared salsa. When I first saw this recipe, I thought that was such a great shortcut. 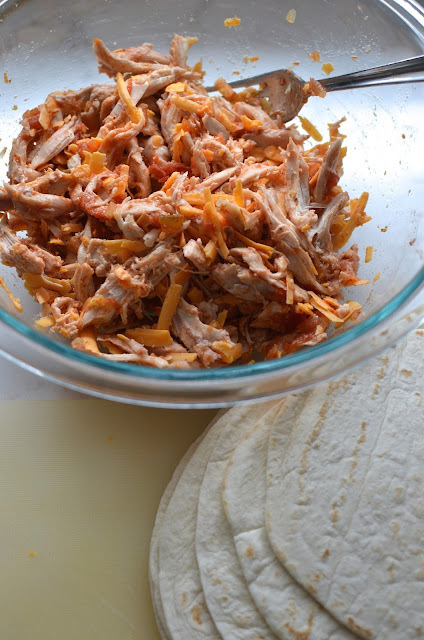 Many other recipes that use store-bought rotisserie chicken still called for some additional cooking - whether it be with onions and/or other aromatic spices and ingredients - but the salsa effectively takes care of that. Then, add shredded cheese; I used sharp yellow cheddar. Finally, toss in some seasoning. I added cumin as well as a little paprika, chili powder, and black pepper. You can play around with it. Either way, mix it all together and it's done! Grab some 6-inch flour tortillas. The benefit of using flour, instead of corn, tortillas is they are softer/easier to roll and you don't need to worry about the shell cracking. Place a generous amount of filling in the lower third of the tortilla and then simply roll them up tight, placing each seam-side down on a parchment-lined baking sheet. Depending on how generously you fill your tortillas (I was quite generous), you'll get 6 to 8 flautas from this recipe. I made 6; some of my tortilla shells were slightly bigger than others and I packed in the filling. I brushed the tops of the rolled tacos with oil, then placed them in a hot 425 degrees. Bake for about 15 minutes or so, until the tortillas are browned and crisp and the cheese starts to ooze out and bubble. They smell delicious and they're ready to eat after a few minutes of cooling time. You can also make them ahead and warm them back up later, or make extra and freeze them for a later day. I served the flautas with a little extra salsa on the side. Needless to say, they would be great with some guacamole. Making them at home, each bite of these is chock full of chicken and flavor. The chicken and cheese filling is a classic, satisfying taste but if you want to be a bit more inventive, try adding other ingredients like black beans into the filling. I was happy to get the hit of gooey cheese we were missing from the recent restaurant version, though I did think I could have been more generous with the cheddar. So when in doubt, go with a little more cheese! In a bowl, mix together the chicken, cheese, seasonings, and salsa for the filling. Place about 1/4 cup of filling onto the lower third of a tortilla. Roll the tortilla up tightly around the filling. Place it, seam-side down, onto the prepared baking sheet. Continue with remaining filing and tortillas. Brush the tops of the flautas with oil, or spray evenly with cooking spray. Bake until the flautas are browned and crisp and the cheese is melted, about 15-18 minutes. Let cool for a few minutes, then serve with additional salsa or other accompaniments you enjoy. Easy peasy and so delicious! Hi Monica, since we live in the southwest we have access to great Mexican food, for a very fair price, except flautas, they usually are frozen even from the restaurants, not many make there own. Thanks for this great recipe, love that they are baked. That is so interesting, Cheri. I don't think I see flautas all the time on menus at Mexican restaurants either (although I could stand to go to more of them). I'm all for lighter versions of restaurant meals at home so baking rater than frying is great here. I enjoy Mexican food and now I wish I could take a bite of one of those flautas…they look nice and crispy without frying. I would love to try these Monica! Cheesy goodness for sure. I love to hear about your food memories - and would have enjoyed the margarita myself! Great recipe - thanks for sharing. These look delish Monica!! 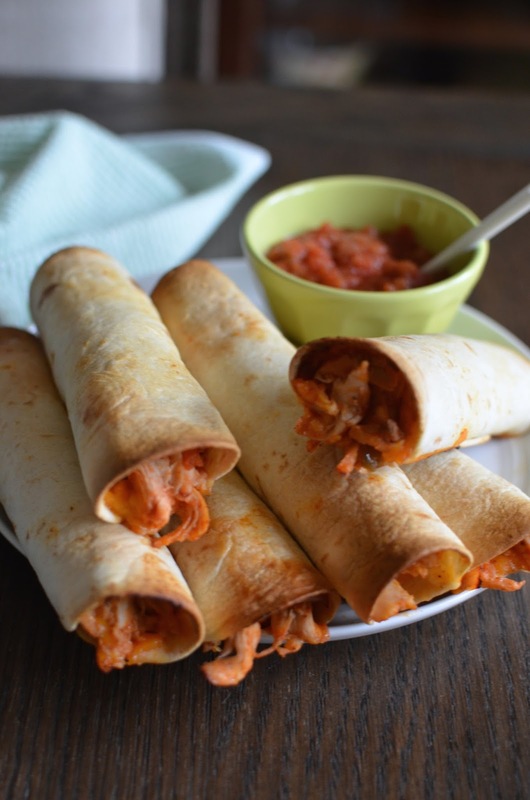 I have only eaten flautas in restaurant but I need to try these at home soon! Taquitos always seem to lurk in the shadows for me, I think because they’re deep fried so I usually ignore them on the menu. I am totally loving this recipe as being baked and how easy it’d be for dinner. I totally hear you! Baking them makes it far, far easier and you can adjust how much cheese, etc. you want in the filling. Hope you give it a go! Gosh I really don't care what people call them. That crispy tortilla and that melted cheese say it all! That's such a good shortcut, perfect for dinner in a hurry! I love a good shortcut, too, Caroline! This is a great shortcut. Love to know about your memories, Adina. Taquitos look so delicious, Monica! Love that you baked them. Crispy and cheesy — the way I like. Amazing we have food memories all over the place and for so many dishes/foods. Love that...and gives us an excuse to enjoy the foods over and over again and reminisce. It's been way too long since I have had these! They are one of my favorites! Thanks for the great recipe. Thanks, Ashley...glad I'm not the only one who thinks about a favorite food and realizes she hasn't had it in ages! A happy Chinese New Year to you and all the best for 2017! Today I'm in bed with a flu, so soup for me. You poor thing! Feel better soon!! Hope you do...we really liked them! The fellas were definitely fans. Happy Chinese New Year to you as well. I'm very stuffed (i.e., in a happy state)! I agree...chicken and cheese is a winner. : ) Thanks, Adina. 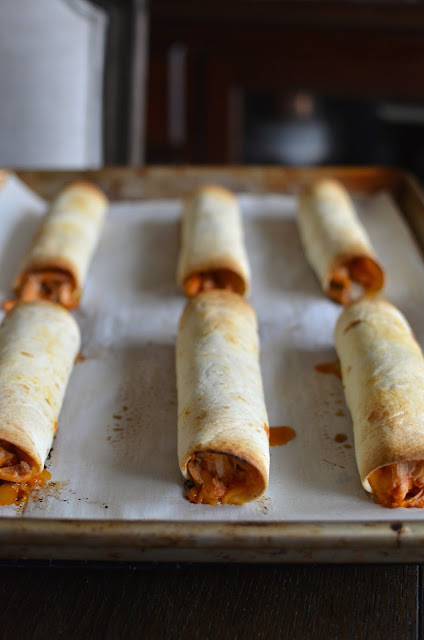 Great way to use up the leftover rotisserie chicken...these flautas look great...chicken and melting cheese...yum! It's so easy using rotisserie chicken. Hope you're having a nice week! Hi Ashley - yes, super easy and reheats well too. I'm really glad I tried baking them at home. beautiful, yummmy thanks for the so delicious recipe and article.